a Helmholtz Initiative and Networking Fund Project. 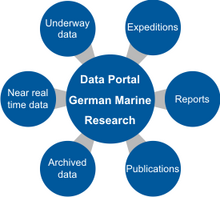 The Marine Network for Integrated Data Access aims to provide a networked approach to access and mining of federated e-infrastructures together with a management strategy targeting its long-term sustainability. With MaNIDA’s network, we will create a new paradigm in respect to integration, harmonization and aggregation of various types of quality-controlled data and related data products. Primary focus will be given to data derived from nationally operated research and monitoring facilities (vessels, observatories, alert systems, etc). Related contextual content and publications will also become an integral part of the aggregation effort. For the community we will improve ingestion workflows, quality control and user support, thereby achieving substantial enhancements in the lifecycle management of marine scientific data. The creation of a data curation and customer support centre is planned as well as various workshops. Finally such procedures for data integration and aggregation will allow for novel combinations among data and data products.